Thank you for helping me pack! Thank you for your suggestions, comments and requests about what to bring for you to smell at the Artisan Fragrance Salon! The winner of the random lucky draw (picked by Random.org) is Yash - who will receive a mini of ArbitRary the moment I hear back of your snail mail addy (well, it will arrive about a week or two after...). In conjunction with the 1st Artisan Fragrance Salon, Ayala Moriel will be teaching a 2nd class on perfume making at Alex Sandor's Studio. 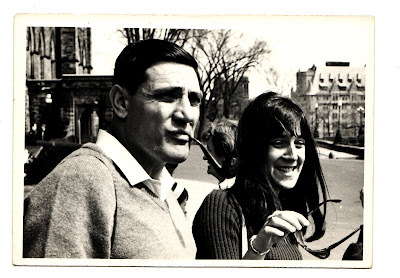 The class last month was so much fun (picture above is of Ayala & Yosh, who also helped to host it); and we hope that those who missed it will be able to attend this one! Learn how to design and create your own personal perfume from precious botanical essences, in pure grain alcohol. 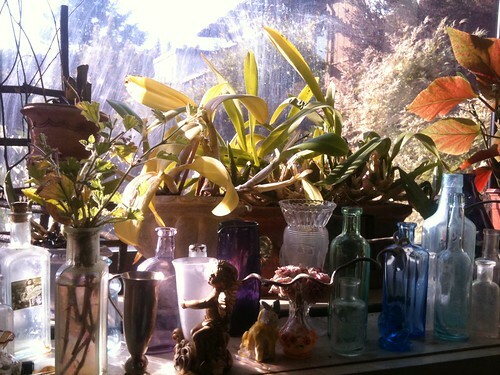 - Explore 40 rare and exotic pure botanical essences from around the world. - Make your very own personal perfume! 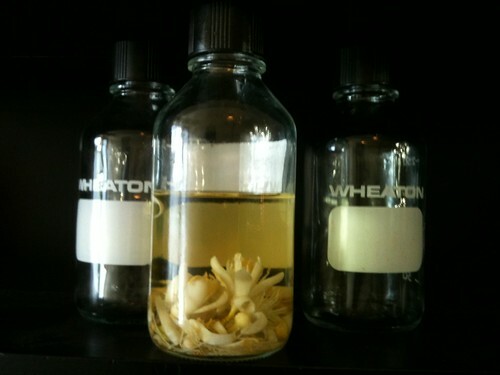 By the end of the workshop, you will have made a perfume to take home with you. We will provide you with a spray bottle, and your own professional-looking label! Sooo - this workshop is offered at $150! There is space for 10 students only, so please let me know as soon as possible - the date is fast approaching! To book - cal (778) 863-0806 or online here. Ayala Moriel is the founder of pioneering natural perfume and bespoke company Ayala Moriel Parfums (est. 2001). She designed countless custom perfumes for discerning customers, celebrities and perfumistas from around the world; as well as for other brands such as - Bodhana's line of 5 solid perfumes; and eco-friendly house cleaning products Sapadilla. 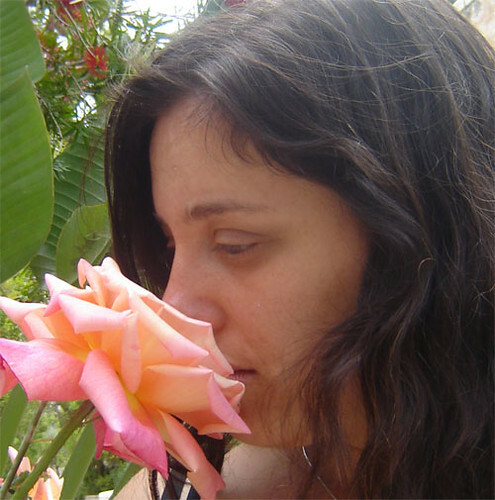 Ms. Moriel has been teaching for 5 years a long term professional natural perfumery training course, as well as many perfume making classes and workshops for amateurs and fragrance lovers of all ages. She was invited to teach and speak in other schools and organizations, including St. George and the BC Association of Practicing Aromatherapists. Alex Sandor's Art Studio is a unique hair salon that takes aesthetics and sustainability to the next level. The beautiful studio is furnished with toxin-free, salvaged and recycled materials and is a serene spot where you can enjoy a serene atmosphere and elite services. Great DIY idea that my friend Yosh has pointed out via Photo Jojo: various ideas for how to scent your printed photographs for added dimension of nostalgia. Great to keep in mind for your next summer vacation scrapbook! I'm giving away 3 tickets for the Artisan Fragrance Salon! P.s. The show is in San Francisco July 8th, 11am-5pm - please be sure you can attend before entering the draw! "If you can envision a true essence of the fruit, deep and pungent, with overtones that are honeyed and rich, then you can see what this is like. 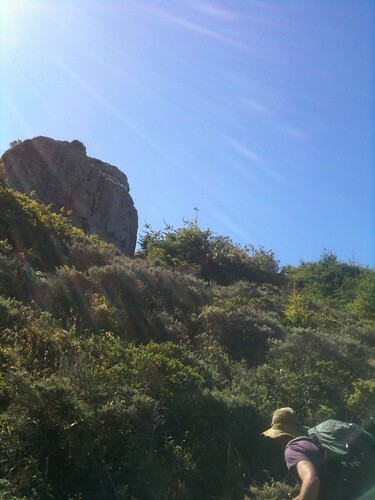 (...) Holding my wrist to my nose, as I write this, that is exactly what I see and feel: that sun". The Huffington Post interviewed a few of the perfumers participating in the Artisan Fragrance Salon in San Francisco (July 8th): Yosh Han from YOSH Olfactory Sense, whom we all should be thankful for having this idea and pitching it to TasteTV; Sarah Horwitz-Thran from Sarah Horwitz Parfums; Ayala Moriel Parfums; Shelley Waddington from EnVoyage Perfumes; and Alyssa Harad, the perfume blogger and now author whose book, Coming to My Senses will be launched at the salon. Self Definition, a photo by Ayala Moriel on Flickr. In case you were wondering what to do after you stop to smell the roses - rose expert Michael Marriott has all the answers in this Wall Street Journal article titled "Sniff Out the Finest Roses"
"A must-smell for serious citrus lovers (...)"
"It starts as a gloriously zesty honeyed citrus, and slowly turns greener and woodier, and takes on an almost herbal cast. What starts as a hint of light and airy incense in the early stages develops into a rich resinous base which lingers for hours, and the citrus lingers on for much of that time as well(...) this is what I’d like my pillow to smell like, all summer long". The discussion among NST's readers is interesting as well - the inevitable issue of price came up, and Robin's response reflects the shift that's happening among perfume and fragrance consumers: they are becoming more interested in handcrafted products, which not only allows them to connect more personally with their creator - but also seems like a better use for their money. "...must say that *if* I’m going to pay more, I mind much less when it’s for an indie product where the perfumer is doing their own tincturing and what not. At least you’re paying for something that matters instead of advertising & so on and so forth..."
Monkey Monday: Help Me Pack! I'm packing for the 1st Artisan Fragrance Salon and I need your help! There is room for only 8 perfumes in my booth (not to mention the suitcase...), and although I have my ideas - I'd like to hear from you what you'd like to sniff. Especially - if you are attending the salon! Among the commenters, there will be a lucky draw to win an ArbitRary mini! I'll also be teaching a perfume making class July 7th at Alex Sandor's studio (4:00-6:30pm - more details on Facebook and here); and giving a presentation at the salon at 12 noon about Scent, Seduction & Storytelling. Basenotes article announces the 1st Artisan Fragrance Salon in San Francisco July 8th at Gallery 4N5, mentioning some of the artisan perfumers participating. Can I even begin to tell you how excited I am to be part of it? I will have a booth there, as well as a 45 minute presentation at 12 noon about scent, seduction and story-telling! 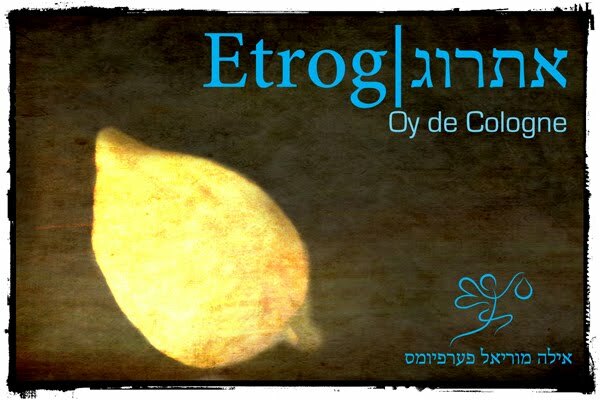 Ida Meister (whom you may know by her perfumista screen name Chaya-Ruchama) has reviewed my newest fragrance, Etrog Oy de Cologne, on Fragrantica. 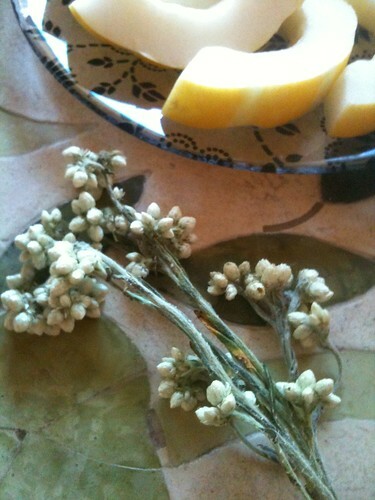 Now Smell This announced Etrog earlier this week as well. Thank you, Robin! Want to add your own review of Etrog? You can do so on Make Up Alley! 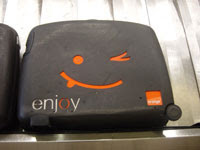 We will have a lucky draw for an Etrog mini among those who post a review of it (draw date: July 31st). Summer is finally here at long last (well, the Vancouver version of it, featuring a rare sunrise and temperatures kissing the recommended room-level). To celebrate, miss T and I are making raw coconut macaroons, and our busy schedule hasn't allowed us to go for an official summer picnic yet, but this will have to come in good time too. Not just because I'm crushed that I can't find any Hail Merry macaroons anywhere (and they don't ship to Canada); but also because there are too many vegans/gluten-free guests at my tea party (this fad has become a staple fashion item among Vancouverites - it's so stylish to be picky about food, not that this would scare me...). 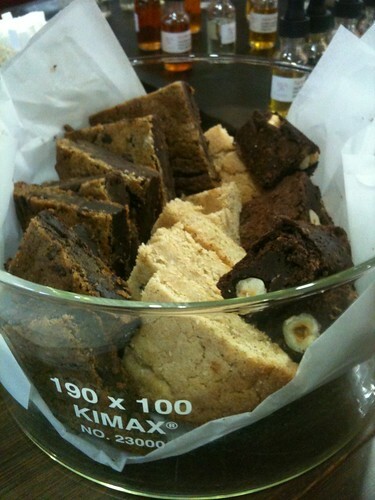 So here it is for you - a very rough recipe, because honestly, you need to trust your fingertips to figure the right consistency of these heavenly unbaked treats. If you live in Vancouver, begin by melting your coconut oil (if you live somewhere where there's real summer, coconut should not be solid at the end of June...). Add maple and vanilla and stir, gradually mixing in the almond meal, salt and coconut. When you can no longer stir with a spoon, start kneading with your bare hands. 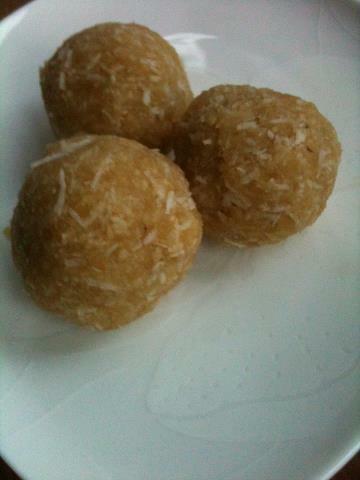 Form into neat little balls - either the size of chocolate truffles, or small macaroons. You may eat them as they are, or refrigerate for a more firm texture (refrigerating is especially a good idea if you live in a warm climate, with real summer, you get the idea...). 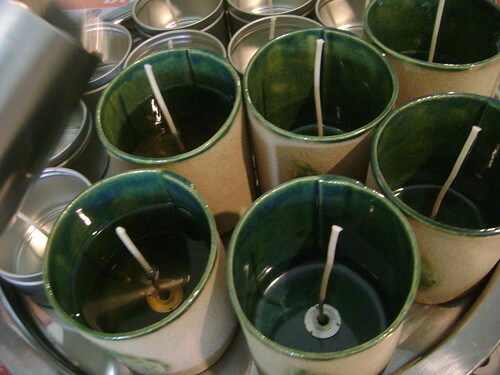 Today, I had a very special guest at the studio - Nikki from Gabriel's Aunt, who drove up for a candle-pouring session. We made 4 scents - 2 are for now (Orcas, Bon Zai) and 2 will be only revealed in the fall. 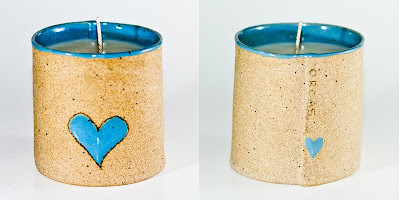 Orcas is a limited edition candle, and is available only in the 8oz ceramic vessels handcrafted by Grace Lee of eikcam. 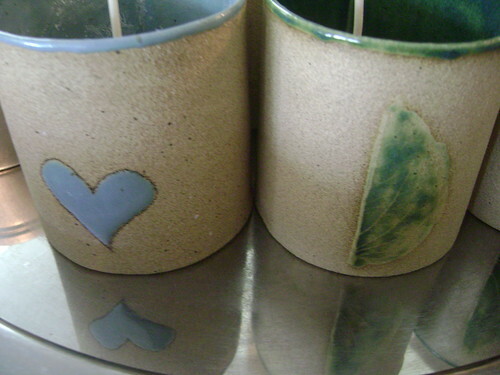 They are hand painted with a blue glazed heart and are absolutely adorable! 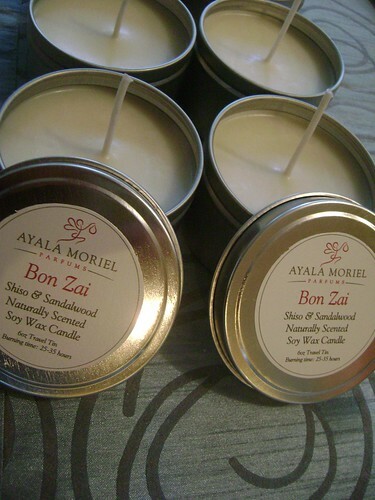 Bon Zai is also available in 8oz with its own ceramic design of shiso leaf imprint. We also poured it in the travel tin size. You're not alone - many people are not sure what to bring dad on Father's Day. Barbecues and tool boxes are great, but for some variety, help dad change around his scent wardrobe and shift gears into summer with something bold, masculine and fun that's like nobody else's cologne. At Ayala Moriel we have special fragrances for dad, beginning with our new Etrog Oy de Cologne! Also - the worst form of government, except all other (aka Democracy) is back for limited time only!!! This masculine ambery chypre is juxtaposes fresh woodsy notes of juniper and bergamot with crisp geranium leaf, over a sensual classic Chypre base of oakmoss, patchouli and labdanum. Don't forget to put your votes in. Orcas has been popular ever since it was conceived, and was even nominated for the Indie FiFi Awards 2012. Capturing the scent of the Pacific Northwest with notes of seaweed, rosemary, spruce and lime - it will also be available in candles as of next week, packaged in our own custom made ceramic vessels by eikcam. And for discerning dads with a taste for something different that's all their own, there are one of a kind perfumes such as Incense & Chocolate, Fougère Classique and Vetiver Blanc. For more ideas, check out my masculine fragrance collection. Assignment Fashion Bridal reviews Ayala Moriel's products and services, highlighting our bridal and honeymoon custom perfume services, bridal stagettes & bridal showers tea & perfume parties, etc. Visit CaFleureBon to read an interview about my newest fragrance - Etrog Oy de Cologne. They are also doing a lucky draw for one person to win a 15ml EDP bottle!!! Just in time for Father's Day, our new Etrog Oy de Cologne is now available online! Due to its delicate flavour and sweet perfume, citron (Citrus medica, or Etrog in Hebrew) garnered mythical significance like no other citrus fruit. It is one of the 4 species in Sukkot, alongside myrtle, willow and palm. Etrog symbolizes the heart, and is said to represent a complete, balanced person: one who has both knowledge and learning, as well as good deeds. 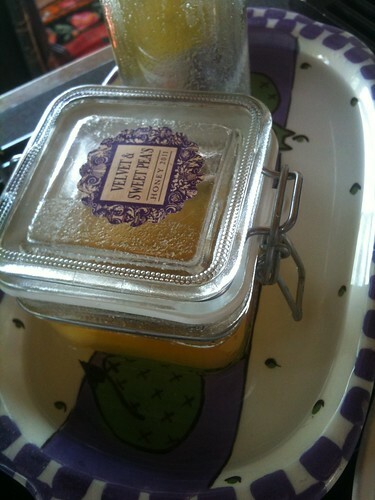 And like all good things, citron fruit is rare, and its essences is even more difficult to find. 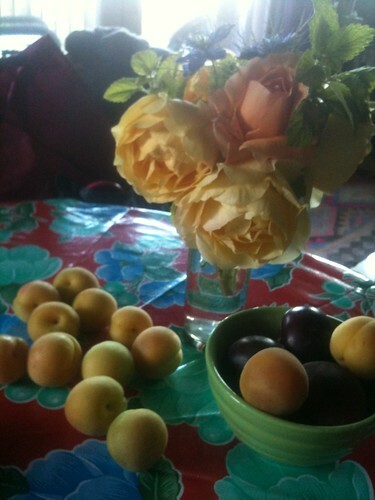 Therefore, the perfumer had to tincture her own: fresh organic fruit was tinctured by her family in Israel, and the rabbi of downtown Vancouver donated his family's Etrogim for 3 consecutive years. Thanks to this community effort - the first "Oy de Cologne"! Ayala Moriel's Etrog Oy de Cologne is a modern twist on a timeless classic: citron zest is paired with pomelo peel to accentuate its subtle floral-citrus aroma, alongside green myrtle and Japanese mint to balance its fruity sweetness. 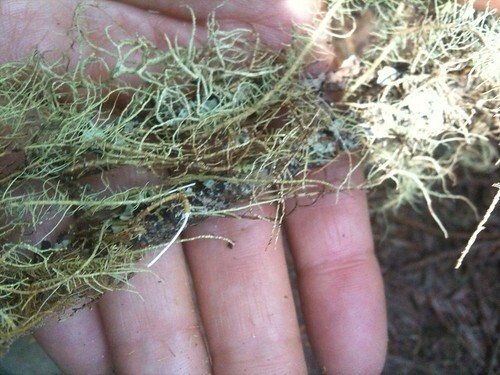 Balsam poplar buds created a honeyed, pulp-like texture alongside Australian lemon myrtle and citron leaves. Ancient olive and incense resins make a lasting impression. 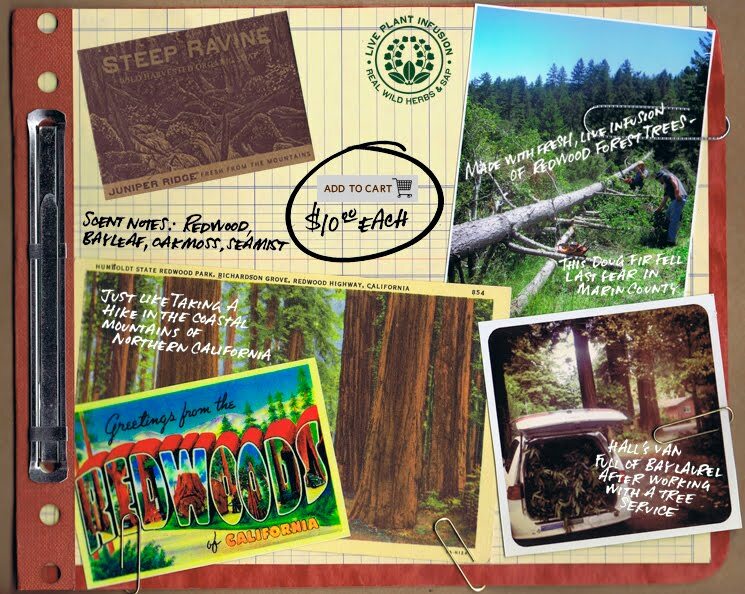 Steep Ravine Soap was inspired by the same trail I hiked last Thursday with Hall Newbegin on one of his Wildflower Hikes. The soap is redolent of citrusy Douglas Fir (Pseudotsuga douglasii), with its crisp evergreen freshness accompanied by Redwood (Sequioa semprevirens) and California's Bay Laurel (Umbellularia californiac) - a warm, spicy evergreen tree that is 100 times more potent than the Mediterranean variety. A little whiff of that will bring you back to reality with a piercing nasal pain that's worse than horseradish!!! You got to stay away from it when you smell it, and than you can enjoy it's spicy, warm qualities which have more depth than the regular bay you're familiar with from cooking, but still bears a resemblance to it. The soap is the usual high quality cold-processed bright green bar that contains the resins and infusions from the plants themselves, not just their essential oils. The saponified oils of palm, coconut, jojoba and olive oil produce a high-lather soap that's good enough to use in shaving, and with a strong scent that's perfect wake-up-call in a morning shower and a relaxing way to end the day if that's when you prefer to bathe. They can also make a great hand soap, and you can be sure that plenty of bacteria will be washed away with all the essential oils that are packed in this soap. 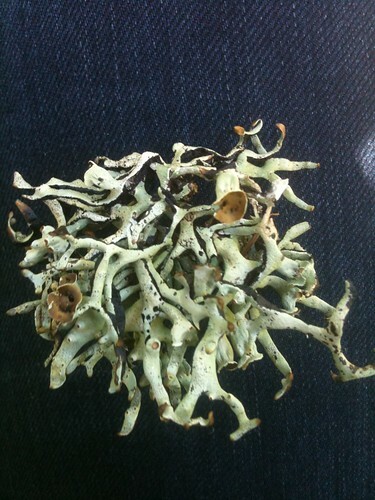 Scent notes include redwood, bay leaf, oakmoss and sea mist. 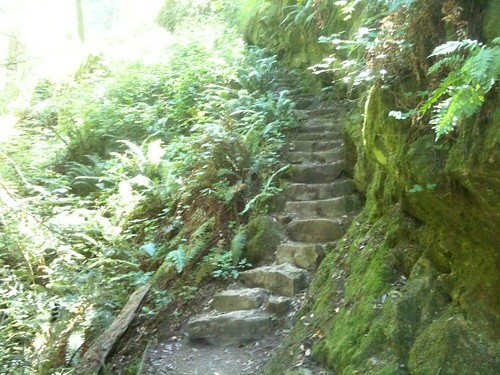 And that's what you will enjoy if you hike up (and down...) Steep Ravine. I love the descriptions on each Juniper Ridge product. They are real and evoke true memories from hikes in the wilderness - in this case, a winter hike, picking mushrooms and staying at a cabin on a rainy night. 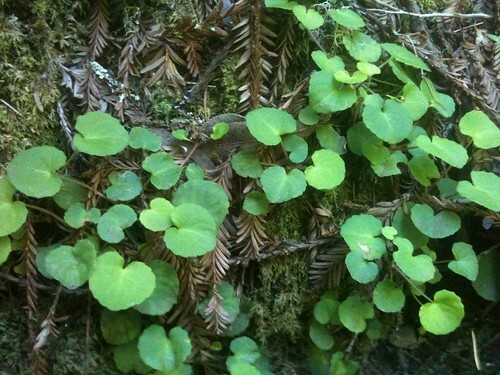 After being there myself this summer, and smelling these plants in their natural habitat, I can enjoy bathing with Steep Ravine soap even more. 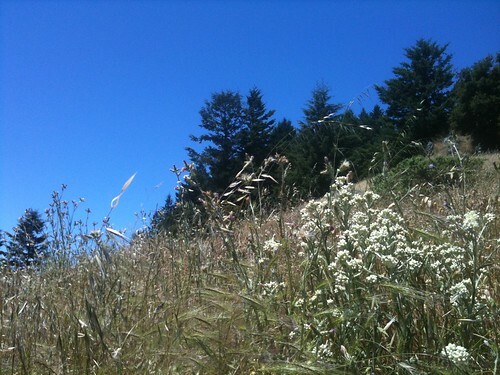 On June 6th, I joined Hall Newbegin and a group of 10 interns from Slide Ranch on a wildflower hike at Steep Ravine. 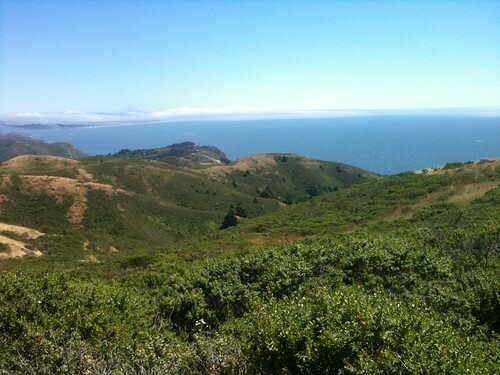 Hall picked me up from El Cerrito, and his car smelled strongly of all the wild herbs and needles he picks to scent the Juniper Ridge wildcrafted line of fragrance products. These include cold processed soaps scented with the real juice of plants, sachets made purely of dried plants from the wilderness, incense sticks, cabin sprays, and most recently - Backpacker's Colognes & solid perfumes that were designed to capture the unique scents that stick to your clothes and your memory after a day of hiking in places such as Big Sur, Steep Ravine or the Mojave Desert. 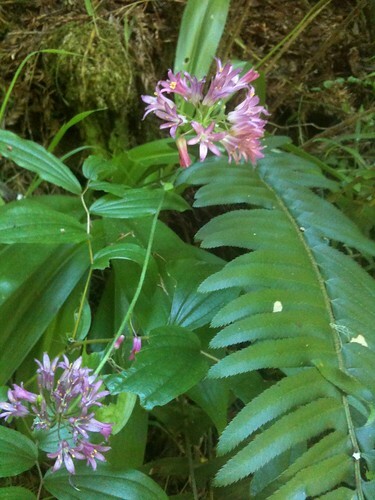 The hike was full of wonderful plants, beautiful scenery, people who are passionate about plants (which I rarely brush by in my urban daily life), and lots of learning, fresh air and we even got to pull out some weeds - invasive species that threaten the unique wild habitat and increase the frequency of forest fires. 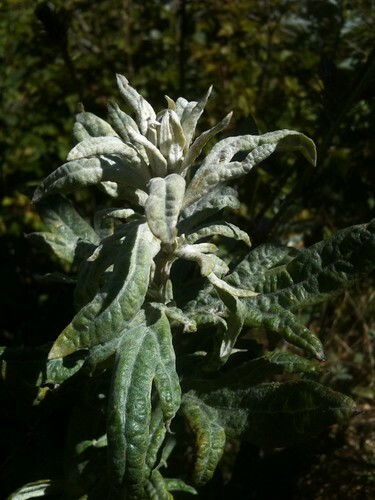 So-called sage (a type of artemisia), which is part of the coastal sage scrub. 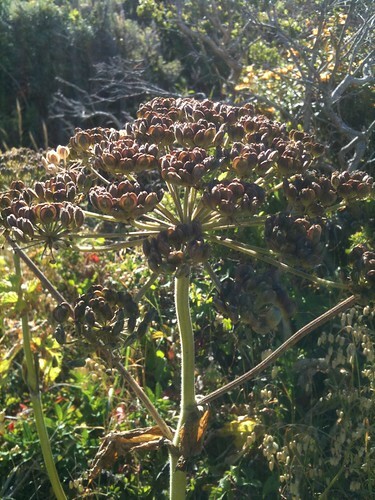 Cow parsnip, a natural nerve-tonic. 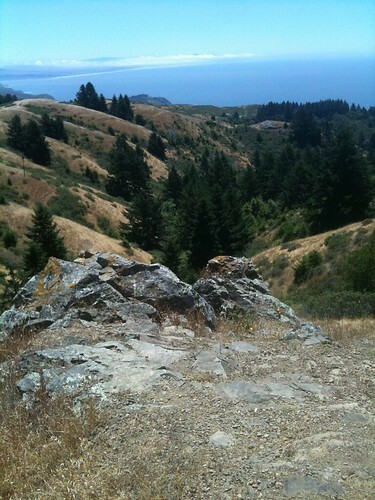 Unusual formation of redwoods (they usually grow straight upwards), unique to the Marin coastal habitat. 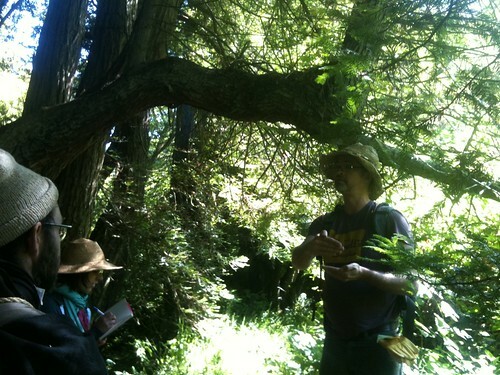 We also stopped by the Douglas Fir tree and picked and smelled needles, which we added to the water. They have a pleasant, citrusy aroma, reminiscent of tangerines. So it's no surprise that they were valued by the natives as a source of vitamin C throughout the winter months. Pissmint (was that really the name?). 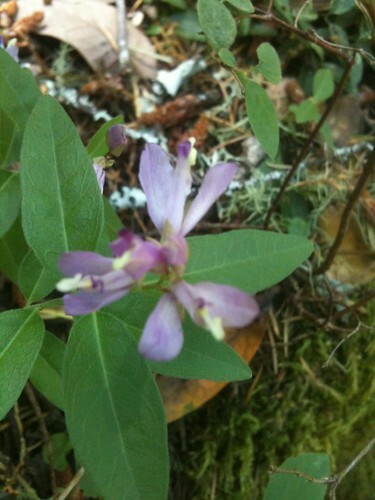 It smelled musky, warm and a little like patchouli. 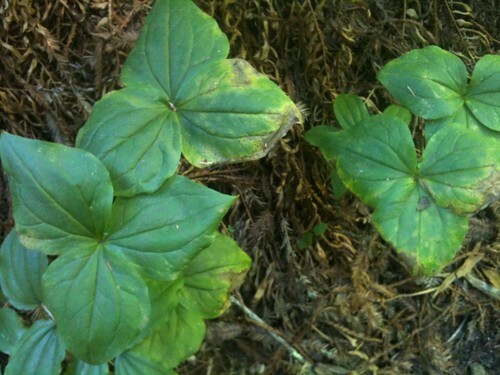 American Ginseng. That's what ColdFX is made of... The leaves smell heavenly! 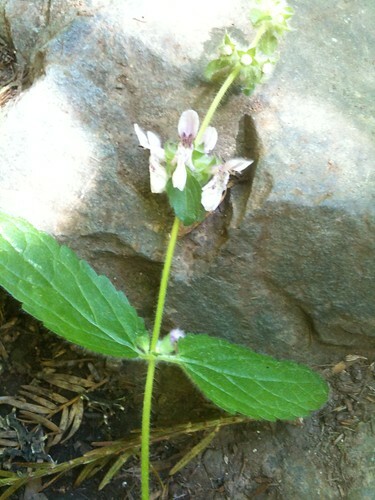 Sort of herbaceously spicy and cucumber-like. Really hard to explain. Trillium, a type of lily, also called birthroot (used by midwives to assist in labour). 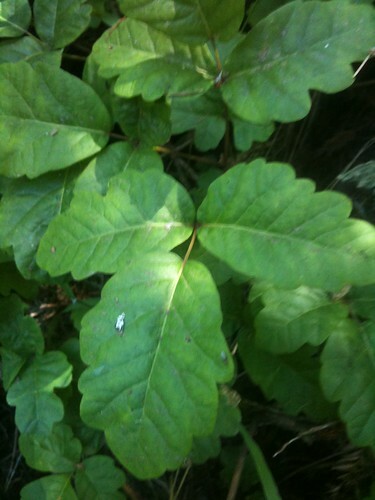 Beware of the poison oak! 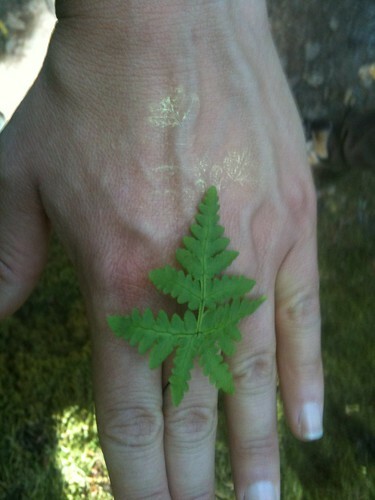 Goldenback fern: The yellow powder on the back of these little ferns can create a temporary mehendi. Fun! 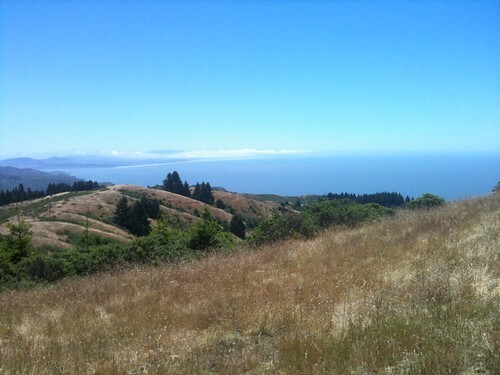 Top of the hill and view of the ocean. Pearly everlasting: Beautiful in and out - this flower has a soft, warm, spicy herbaceous scent, more deliacate than other helicrysums that I've smelled. 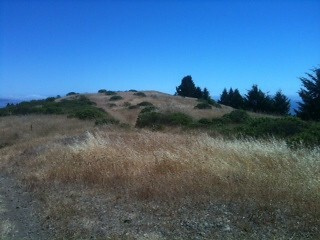 Hills with lots of coyote bush. 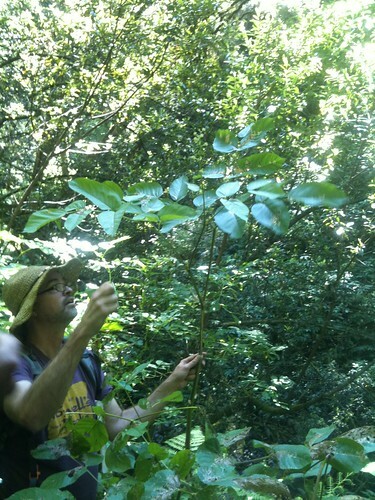 The only part of the hike that was really steep: a small group of us went down this cliff to the bottom of the creek to uproot an invasive species that takes over the habitat. The rest remained on the top meadow, to get rid of thistles that bring on too many frequent forest fires and chase away the native plants. 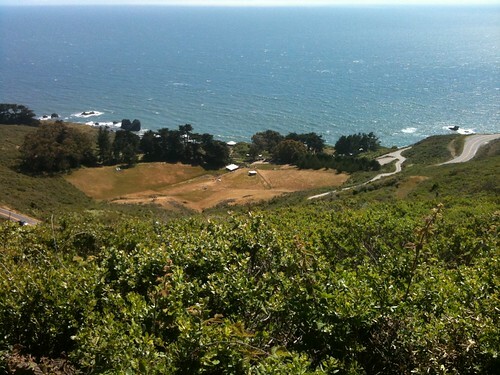 View of Slide Ranch - an educational farm just by the beach. 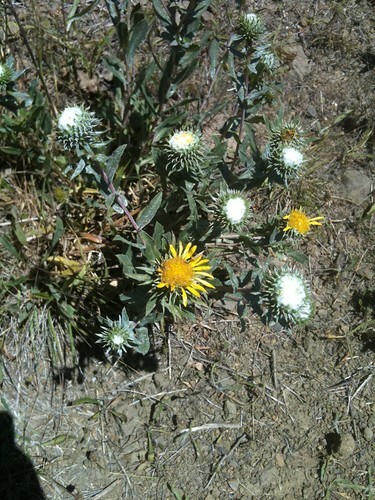 The flowers of Gumweed (Grindelia), a native American thorny plant, have a liquid white, sweet, sticky gum that's used to clear out lung infections. 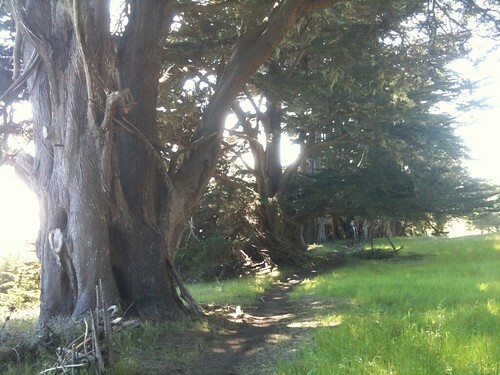 Gigantic cypress trees by Slide Ranch. 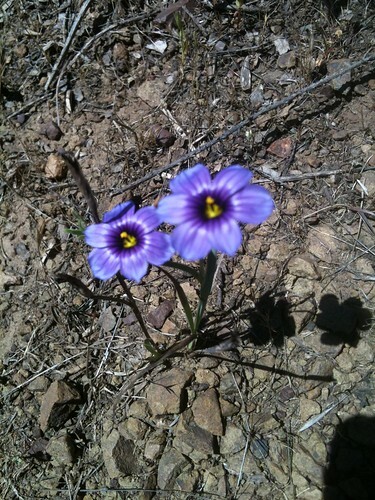 This photo really does not do them any justice. On the way back, Hall pulls out a bottle of oil infused with desert Chaparal from the Mojave desert and slabs some on my hand, than douses his face with it, contemplating compounding a beard oil out of it. The car fills with the bitter, spicy, smoky, warm and intriguing desert dryness, transporting me to somewhere I've never been to and make me feel as if I'm standing under the starry desert night and brewing a bitter tea on the campfire. 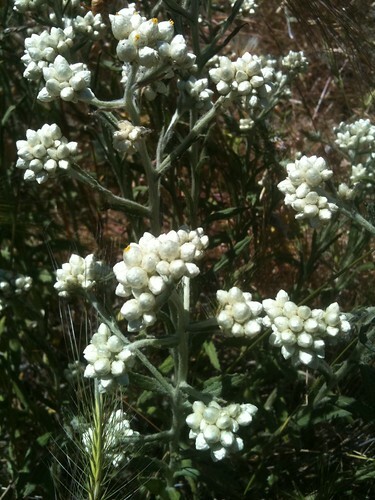 It was an inspiring, adventurous day and the highlights of all the plants from an aromatic point of view were the pearly everlasting and the white gum-producing plant. Next I will tell you about the Steep Ravine perfume and soap that Hall has created as an inspiration from this beautiful trail. 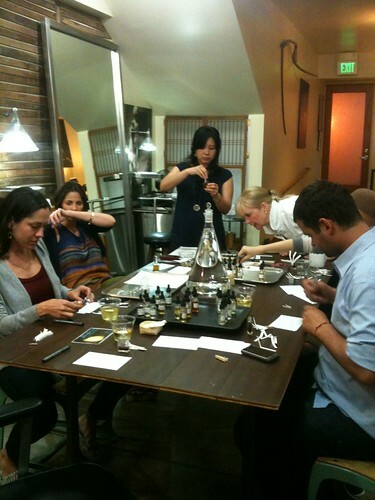 I had a wonderful time teaching an evening class of perfume making at Alex Sandor Art Studio. 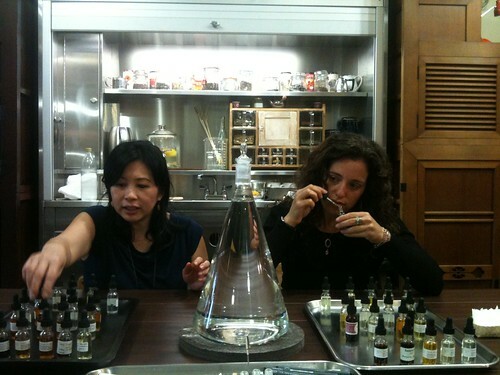 Yosh of Yosh Olfactory Sense co-hosted and assisted me and everyone created beautiful perfumes to call their own! Here are some pics, and also a quick shout out for all of you who were not able to make it: we will be hosting another one in July, around the date of the Artisan Fragrance Salon (exact date & time TBA). If interested, please contact me via email: ayala (at) ayalamoriel.com. Alex & Amanda making decisions! 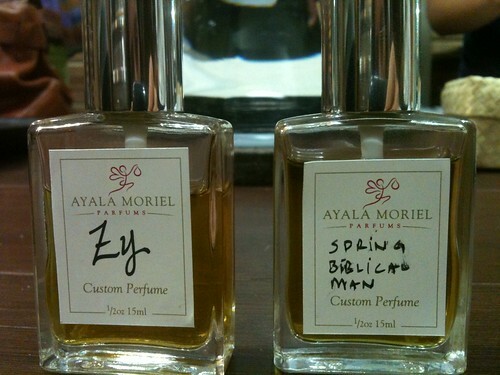 Custom perfumes created that evening - some yet to be named... And Alex still writing on his "Spring Biblical Man" label! 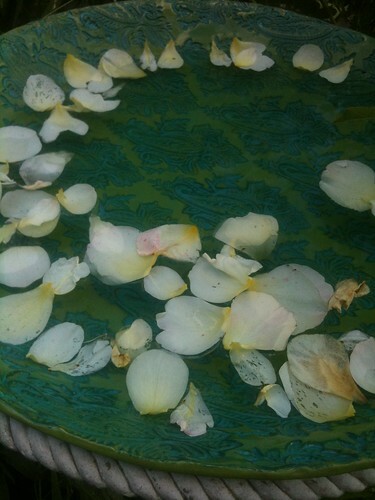 Learn how to design and create your own personal perfume from precious botanical essences, in pure grain alcohol. 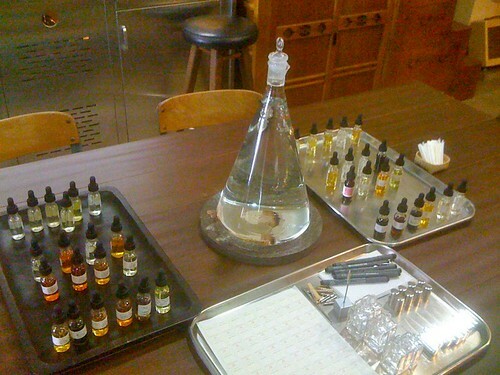 By the end of the workshop, you will have made a perfume to take home with you. We will provide you with a spray bottle, and your own professional-looking label! This workshop is offered at $150 just to cover the basic materials and supplies costs There are (pre-registration is over, so you will have to pay at the door, or online here. Please text me to confirm your spot as I'm unable to take calls while out of Canada (778) 863-0806. 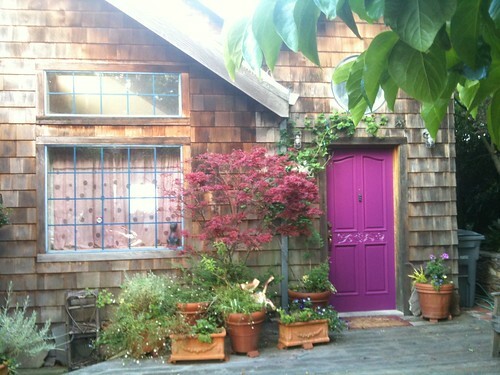 When Laurie Stern of Velvet & Sweet Pea's Purrfumery has invited me to stay at her cottage in El Cerrito - little did I know that I signed up for an aromatic retreat among her bees, cats, fruit and flowers. 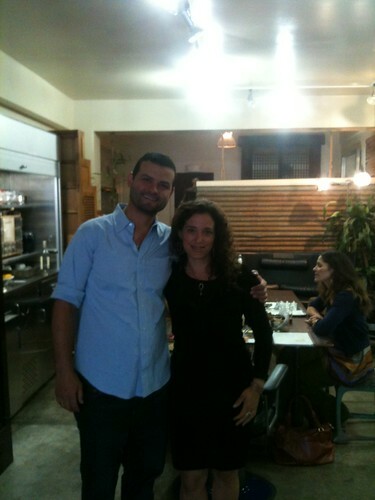 And most importantly - made a new perfumer friend! Laurie and I passed each other's paths virtually at Persephenie's shop (then called Blunda). Laurie was there in March 2009, and I arrived a month later for my Hanami exhibit. I fell in love with her whipped body frostings, and we exchanged emails, samples and beautiful greeting cards. It wasn't till last year when we drove to Yosh's party that I finally had the pleasure of experiencing her genuine warmth in person. 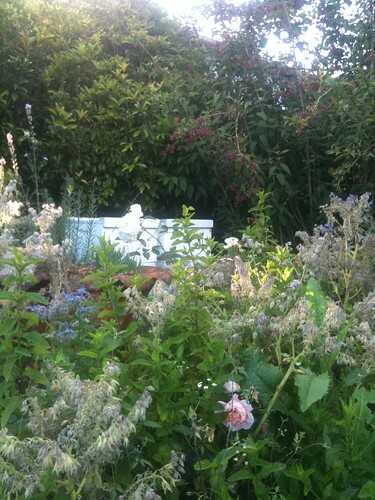 She's literally as sweet as the honey made by the bees in her garden, which is redolent of the many aromatic plants growing within: jasmine, honeysuckle, lavender, geraniums and mints (the beehives are in the photo below). 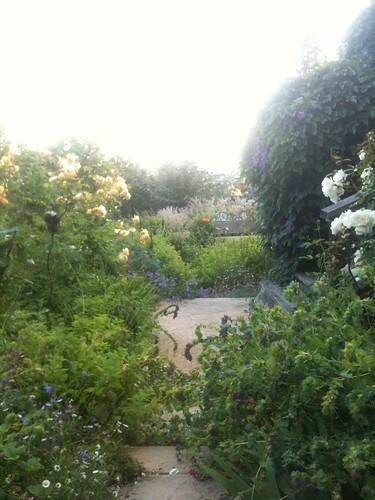 The garden is so full of life, and the aromas weave from all directions. 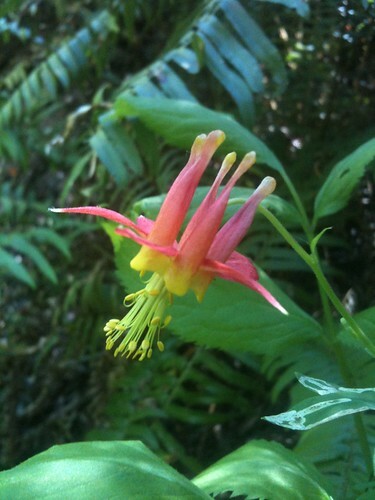 Laurie had a flower business in her past life, and her husband is a landscape architect. Together they make a wonderful team, and their home is just beautiful and full of little treasures to feast the eyes and the nose on. The sealing of the living room and kitchen is decorated with dried bouquets of hydrangae, and even the kitchen window is a beauty. 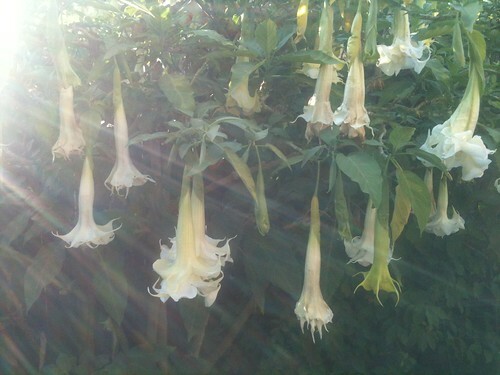 At nightfall, the garden and my room filled with the sweet, citrus and heliotropin confectionary maddness of Angel's Trumpet. 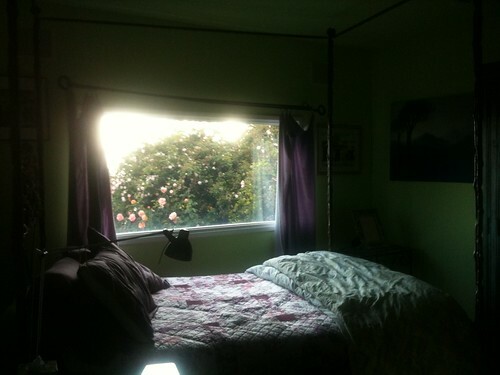 I put a flower right by my bedside, and it never failed to bring a restful sleep. Melon and helicrysum sweetened the last evening of my trip; including the company of a few perfumer friends who stopped to say hello (and goodbye). Of all the things in the world, Laurie Stern reminds me of the Lady Oyolaela in the Neverending Story (excuse my spelling: I cannot find any reference to this wonderful character's name). 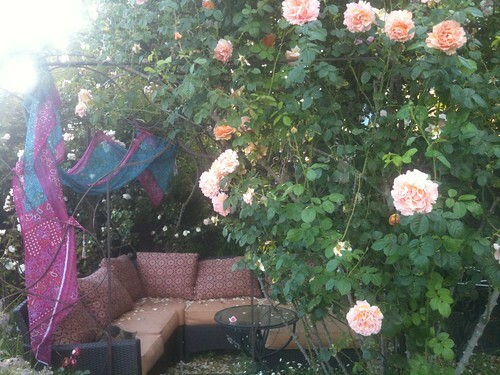 She's a lady of the garden, and is the garden - and it is always in full bloom and brimming with luscious ripe fruit that put her guests under a spell: time stops at her garden and one would forget they need to leave and go about their business... Which was like a gift from heaven on such an action-packed trip. And indeed, I didn't want to leave this place of serenity and friendship, and if it wasn't for my daughter I probably would never have... My only consolation was that I'll be back in San Francisco in less than a month, for the Artisan Fragrance Salon, and will be able to see all my perfumer friends again!